For years, I have configured my eComStation computers to use Flashblock for a more stable websurfing experience under Firefox and SeaMonkey. At some point, this strategy became unworkable. The scripting that Flashblock uses to do its work caused the OS/2 port to crash. It's easier to change to a different extension than it is to fix Firefox. The plugin I now use, NoScript, is fairly obtrusive. It stops all kinds of bad behavior, and virtually every major website needs to be whitelisted in order to use it. But Firefox on eComStation is stable with it running, so I accept the inconvenience of being notified of every transgression that modern web-coders make. After surfing to my usual round of websites and adjusting the sites which are allowed to do what they want to do, the daily use of NoScript is fairly transparent. I'm more at ease looking at unknown websites, because NoScript will stop most of the really stupid attacks. To install, go to http://noscript.net/ and follow the instructions to install. 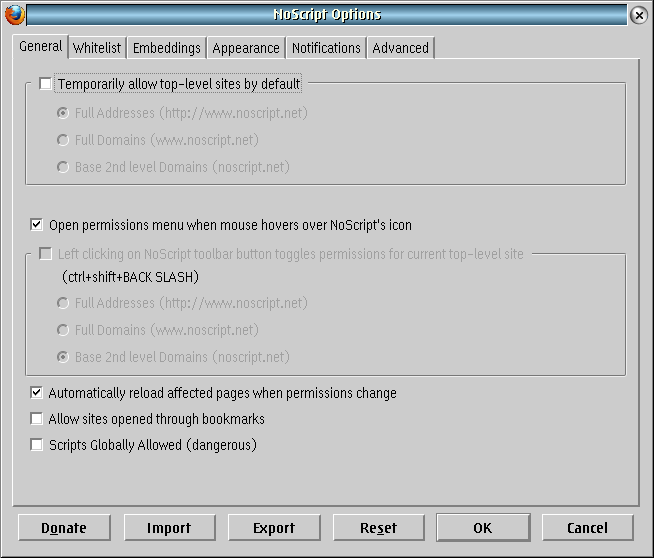 After installation, find the new NoScript button and look around the options to find out more about how to use this extension. I won't get into setting each option, because every user will have different preferences. NoScript is good about automatically updating, which is needed as web developers devise increasingly evil scripting for their nefarious purposes.